Sweet-toothed rebel rousers now have a home they can hit up over and over again, because beloved food truck Captain Cookie & The Milkman now has a storefront. Founder Kirk Francis says the Chipwich is the most popular item after midnight. The cookies are warm, and the ice cream is cold -- say no more. Washing down a peanut butter cookie with chocolate milk from local creamery, Trickling Springs, is another smooth move before bed. 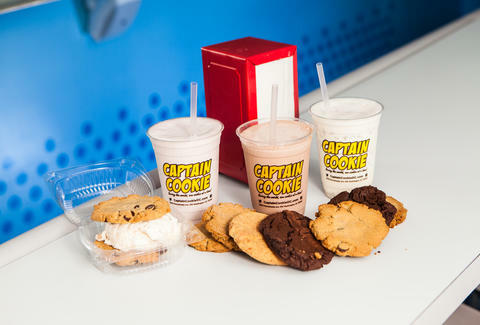 Captain Cookie & The Milkman is open until 2am on Fridays and Saturdays. One step into this basement ramen-and-rice bowl restaurant and you’ll feel like you’re in a Hayao Miyazaki movie thanks to the oddball décor. 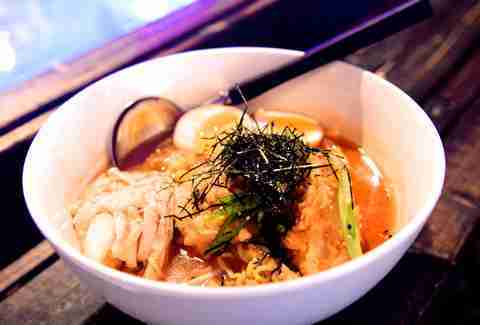 Fortunately, the menu is easy enough for the inebriated to understand with just four flavors of ramen: miso, kimchi, curry, and (though less-traditional) tom yum. When your gargantuan meal arrives, nod and smile because it all makes sense. "Oki" means "big" in Japanese. Atmosphere-wise, they play the hits. Loudly. So try not to cry into your noodles when Sam Smith comes on. They’ll serve you until 3am on Fridays and Saturdays. This new spot is committed to bringing you fresh tacos around the clock. Each taco option is named after the part of the world it pays tribute to, like Phuket with teriyaki short ribs or Maui with grilled rockfish. 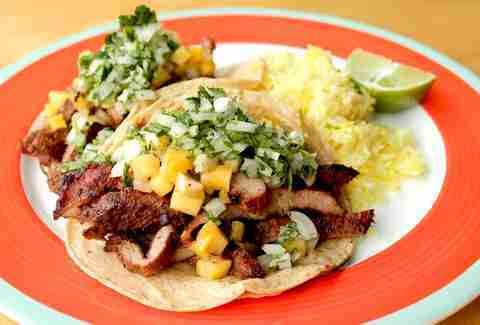 An order comes with two tacos, and none surpass $10. The same holds true for the burritos and quesadillas. This should be welcome news, since you’re likely visiting this 24/7 spot after dumping dollar bills at nearby bars. Note that they offer a limited menu from 11pm-11am, and it’s grab-and-go. Grand Trunk serves steaming bowls of Indian curry, tikkas, and loaded waffle fries until 4am on Fridays and Saturdays. 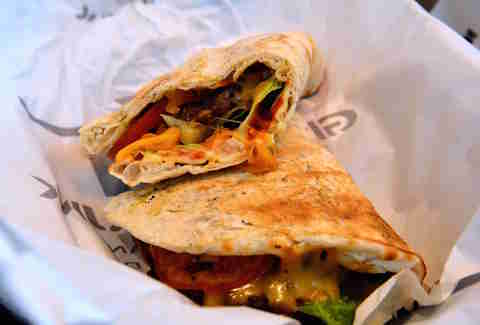 Late-night, though, you’re ordering the satisfying Grand Trunk Naan Burger: two beef patties boosted by spices like ginger, black cumin, and green chilies get a hug from warm naan. Let’s just say the naan is so good you’ll be frowning at buns for the rest of your life. Along the same lines, forgo usual condiments like ketchup in place of the mint chutney and sweet tamarind sauce. The whole shebang costs $7.95. Don’t leave without venturing downstairs -- the staircase with TVs leans trippy. Meat on a stick. Meat in a carb pouch. 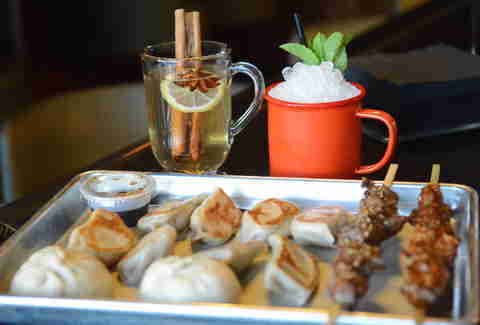 You can’t really go wrong late-night at Copycat Co., because they’ll serve you skewers and dumplings until 3am on weekends, and until 2am on weekdays. 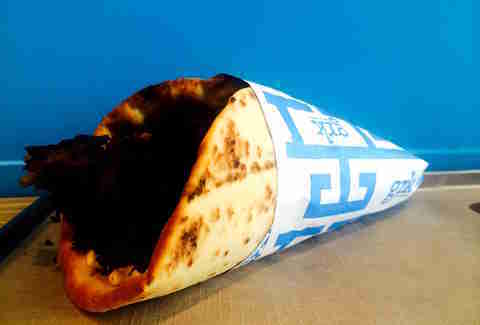 Take solace knowing that nothing on the Northern Chinese street-food menu costs more than $4. Note that you can get grub in the grab-and-go area downstairs or the more posh bar upstairs, where you better be drinking one of Devin Gong’s cocktails. Maybe these "Yeeros" (so you'll say it right) will remind you of your study abroad experience. You know, when you left the club at 5am wearing too-tight Euro pants and wandered into the first Döner kebab shop that was spinning meat. GRK’s like that, only better, and there’s no language barrier. Ordering is a cinch: decide if you want a pita or a plate, then focus on your biggest decision: chicken, pork, lamb & beef, or portabello. Lamb & beef is the right answer, especially when topped with spicy tzatziki called kaftero. Get your hands on one until 3am on Fridays and Saturdays. Compass Rose debuted a dish that practically parted the seas when it opened, and now you can get it until 2am on Fridays and Saturdays, thanks the demands of the boozy masses. 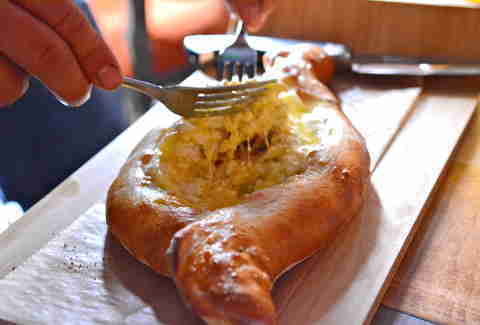 The Georgian menu item, called khachapuri, is a bread kayak and the passengers are butter, cheese, and egg. What’s cool is that Compass Rose recently launched Saturday night house parties from 11pm onwards complete with DJ music, kegs of craft beers, and even red Solo cups with Sharpie name tattoos. Khachapuri is the only edible option at this time, but no one’s complaining.